While the Latrobe River benefited from the delivery of autumn freshes - watering that exceeds the base flow, lasting for one or several days - in 2014–15, the lower Latrobe wetlands continued an all-important drying regime. While the Latrobe River benefited from the delivery of autumn freshes – watering that exceeds the base flow, lasting for one or several days - in 2014–15, the lower Latrobe wetlands continued an all-important drying regime (link to planning senarios). The drying regime included the Sale Common where drying is occurring as part of a four-year program to manage an abundance of giant rush – a native semi-aquatic plant species. Giant rush has the potential to crowd out other plants and reduce the diversity of animals. David Stork, Environmental Water Officer at the West Gippsland Catchment Management Authority said, "Drying has been highly successful in reducing the extent of giant rush in Sale Common, which had been taking over the wetland after a rapid wetting and drying event following the drought." "Drying phases are generally important for the health of the lower Latrobe wetlands as they enable the soil to oxygenate and organic matter to break down," David said. "They also encourage the growth and reproduction of wetland plants, and help to reduce the abundance and size of European carp." Autumn freshes in the Latrobe River in 2014–15 aimed to prevent non aquatic plants from encroaching on channels, wet in-stream and bank plants, improve channel stability and in-stream habitat, provide connectivity for fish to move up and down the river and improve water quality in the estuarine sections of the river. 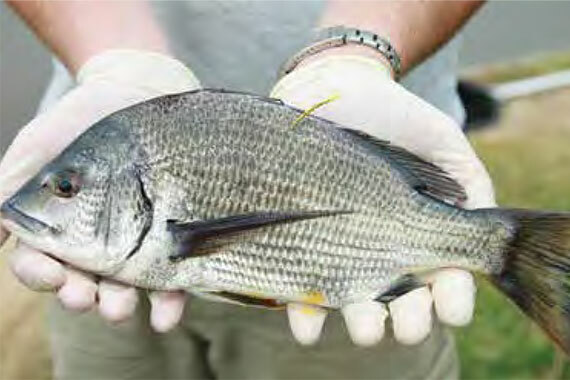 Black bream were monitored to understand how they responded to the autumn environmental water releases. David said, "Over 50 black bream in the lower Latrobe River were tagged to monitor their movements in response to changes in flow conditions." "This information will be used to advance management of environmental water releases in the future."